● They look gorgeous your kitchen. ● Optimal size of the mixing bowl set selected for saving space in your kitchen. Mixing bowl set WITHOUT LIDS! ✅ HIGH QUALITY MATERIAL mixing bowls - stainless steel 304. Thickness 0.3 mm. Designed for frequent permanent use. 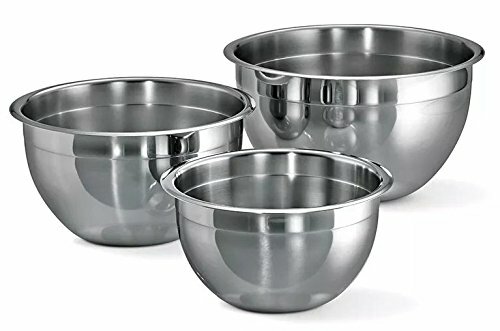 ✅ COMPACT metal MIXING BOWL SET. Takes up little space in the kitchen or refrigerator. Optimal size mixing bowls: Diameter - 7.1 inch, 7.9 inch, 8.6 inch. CAN BE WASHED IN THE DISHWASHER! ✅ NON TOXIC. This set of mixing bowls is made using the highest quality stainless steel. Nontoxic materials that don't affect the taste of your food and will maintain their unrivaled characteristics even after numerous washes! Mixing bowls confirmed by quality certificates of FDA, and СЕ (European quality certificate). ✅ You'll LOVE using our STAINLESS STEEL MIXING BOWLS! If you have any questions about this product by AG Market Bowls, contact us by completing and submitting the form below. If you are looking for a specif part number, please include it with your message.